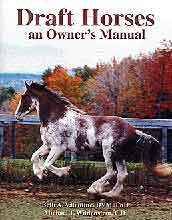 Dr. Valentine is co-author of Draft Horses, an Owner's Manual. She is a graduate of the Veterinary College at Cornell University. After receiving her degree she spent a short time in private practice. Feeling compelled to understand more about the diseases she was trying to treat, she left practice to begin training in Veterinary Pathology in the Comparative Medicine Division of the Johns Hopkins Medical College. From there she went back to the Veterinary College at Cornell, She is currently a veterinary anatomic pathologist in the College of Veterinary Medicine at Oregon State University. She passed the boards of the American College of Veterinary Pathologists in 1985. As a diagnostic pathologist, she deals with diseases of many different species on a daily basis. A horse owner herself, she started out with two saddle horsesher chestnut grade gelding Millertime (right) and her husband's Thoroughbred Murphy (not shown). 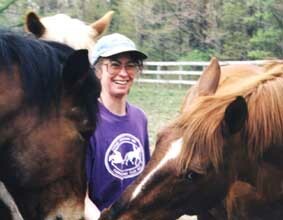 Due to her studies of equine polysaccharide storage myopathy (EPSM) in draft horses, she now owns four heavy horses. The two additional horsesa Belgian/Thoroughbred riding horse Astaire (blonde ears over her right shoulder) that used to "tie up," and a bay Belgian/Percheron working draft Jerry (left) that had developed a stiff hind limb gait, muscle loss, and lack of energycame to her because of their muscle problems. She is happy to report that all four horses are doing extremely well on the new low carbohydrate, high fat diet designed by Dr. Harold (Skip) Hintz and Dr. Arleigh Reynolds, nutritionists at Cornell, to control this problem. Dr. Beth continues to have a special interest in diseases of muscles and nerves (neuromuscular diseases). Recognizing that, in veterinary medicine, proper muscle function is most important to the well-being of horses, she specializes in equine neuromuscular disease. In addition, she has taken on the task of trying to better understand all equine disease. She is particularly interested in problems that plague draft horses.